“Kaza, you'll see, in 30 to 40 years everything will change for the better. There will not be intolerance, there will not be discrimination. Everyone will be proud of who they are. This is the Jewish land, this is Israel, just a little patience and it will all be alright..."
This optimistic dialogue delivered by Josh (Assa Gross), the Police Captain in the musical "Kazablan", to his friend Kaza (David Friedman), at one of the dozens of the Mifgash Theatre rehearsals that took place over many months leading up to the opening day of the musical "Kazablan". The critically acclaimed play - written by Igal Mosinzon and directed by Yael Feinglold - was performed in April at the Al Green Theatre in the Miles Nadal JCC at Bloor and Spadina. 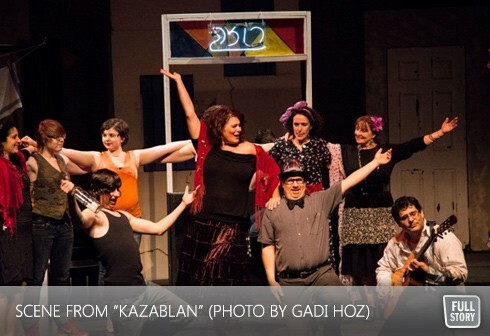 The Mifgash Theatre, Toronto’s only Hebrew-language theatre company and supported by UJA Federation, was established in 2008 as part of a larger initiative to reach out to the growing Israeli-Canadian community, many of whom felt disconnected from the larger Jewish community. In the centre of the play is a rundown neighbourhood in Jaffa in the 1950's, where residents are faced with an eviction notice. Kazablan, a new immigrant from Morocco and a gang leader, leads the resistance while courting Rachel (Tal Rosenzwieg) whose Polish father, Feldman (Michael Graf), is opposing their romance. "A play that deals with the acclimatization of immigrants to a new place will always be relevant," says David Friedman, who plays Kazablan. David, a graduate of the Beth Zvi Acting Academy and a professional actor, is also a veteran of the Mifgash Theatre and has participated in each of its seven productions, always in a lead role. "Kazablan is one of the best Israeli musicals ever written, and this is a great opportunity for me,” said David. In addition to returning actors, there were some first time participants to the Mifgash Theatre. Shay Fuchs, a professor at University of Toronto, has been drawn to the performing arts from a young age, and participated in plays in his high school in Jerusalem. After his military service he devoted all his time to academics and to his family, and only 2 years ago returned to acting.